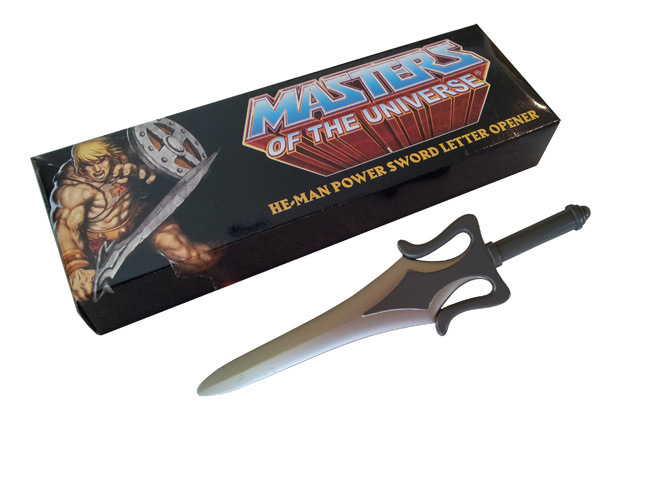 Set to hit retail in 4th Quarter 2012, fans will be able to sheath their He-Man Power Sword Letter Opener in the Masters of the Universe Castle Grayskull Business Card Holder ($35 MSRP). They'll also have an opportunity to display their business cards in this highly-detailed replica of the Castle Grayskull entrance, complete with a movable "jawbridge"! Painted by the Four Horsemen, the card holder showcases the beautiful Coat of Arms crest and the menacing skull facade. Lower the "jawbridge" to display business cards on the lower teeth. Items will be available at collector and hobby online and retail stores later this year as they roll out. "We are pleased to offer such exciting products from the Masters of the Universe brand. These unique office products put the 'fun' back in functional," said Rose Wang, President. Icon Heroes is a leading manufacturer of pop culture toys and collectibles. They bring popular characters to life and are excited to be recreating characters from one of our favorite 1980's animated television shows - Masters of the Universe! Masters of the Universe is one of the largest and most popular brands in the history of the male action category. First launched as a toy line by Mattel in 1982, the Masters of the Universe television series debuted one year later in 1983, and introduced the iconic phrase, "By the power of Grayskull... I have the power! " to fans nationwide. The story is set on the planet Eternia where throughout time war has raged. Heroes like King Grayskull, Vikor and the legendary He-Man have heeded the call to rise and fight. These heroes strive to protect the Power of the Universe from the forces of Evil; for he who can harness this awesome power, shall master the universe!